Tegel is a Berlin airport. 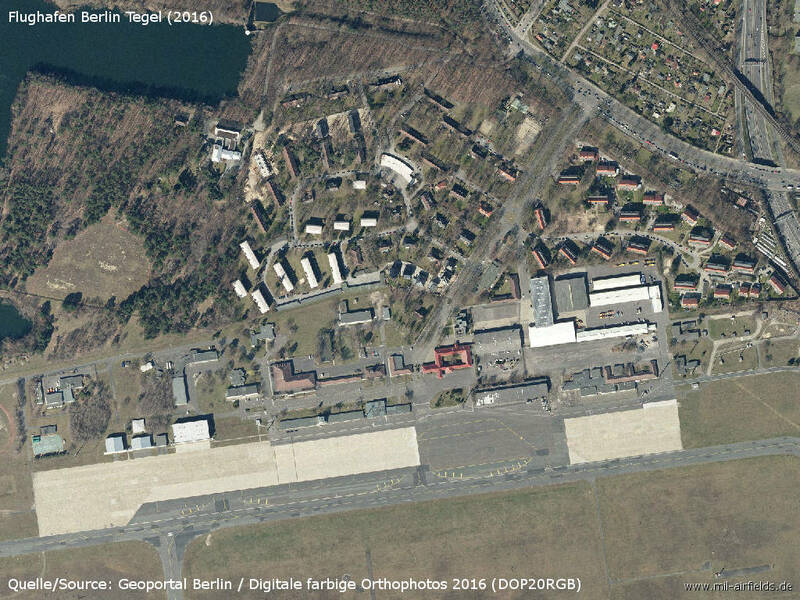 A first predecessor was created at the beginning of the 20th century, when an airships division moved from the Tempelhofer Feld to a barracks on the southern edge of the Tegel shooting range. This use ended with the end of the First World War, because thereafter Germany was forbidden to maintain its own air force. The next flying activity followed in the 1930s, when the area was used for a time to test rockets. 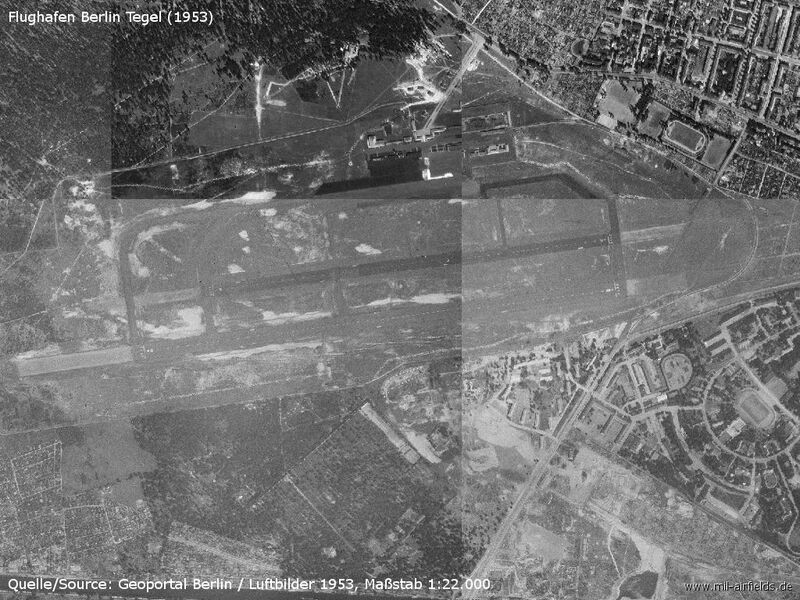 Finally the actual Tegel airport has been built in 1948 during the Berlin Airlift, in order to increase the airfield capacity in Berlin. After the Airlift, it served as a military airfield for the French armed forces, on which also a civil air transport took place. 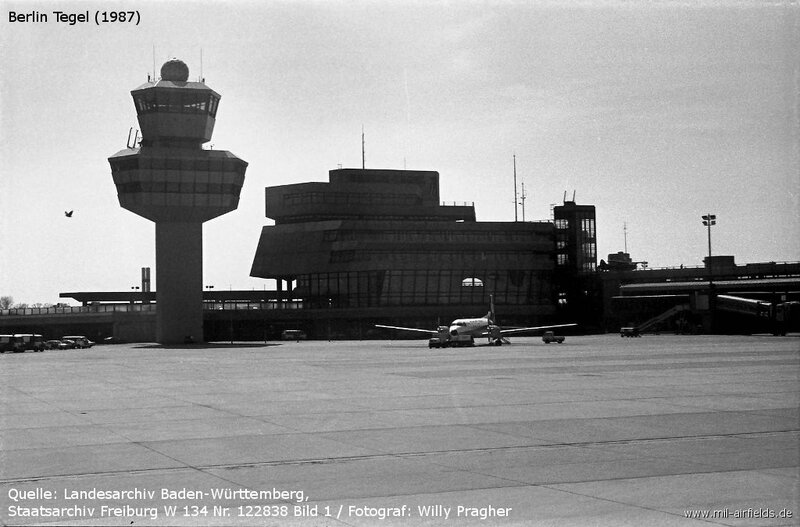 In 1974, the hexagonal terminal has been opened on the south side, and Tegel took over the entire air traffic of the free part of the city. 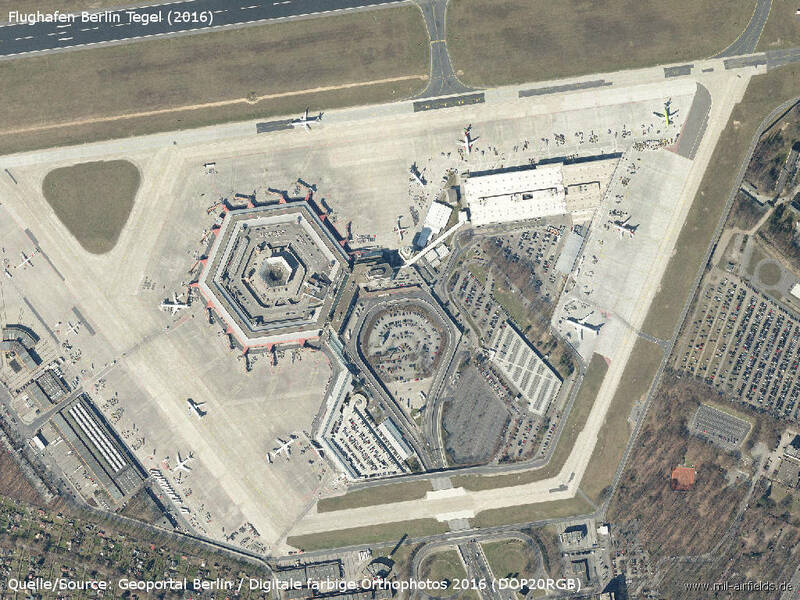 After the reunification in 1990, Tegel developed into the most important airport of Berlin. 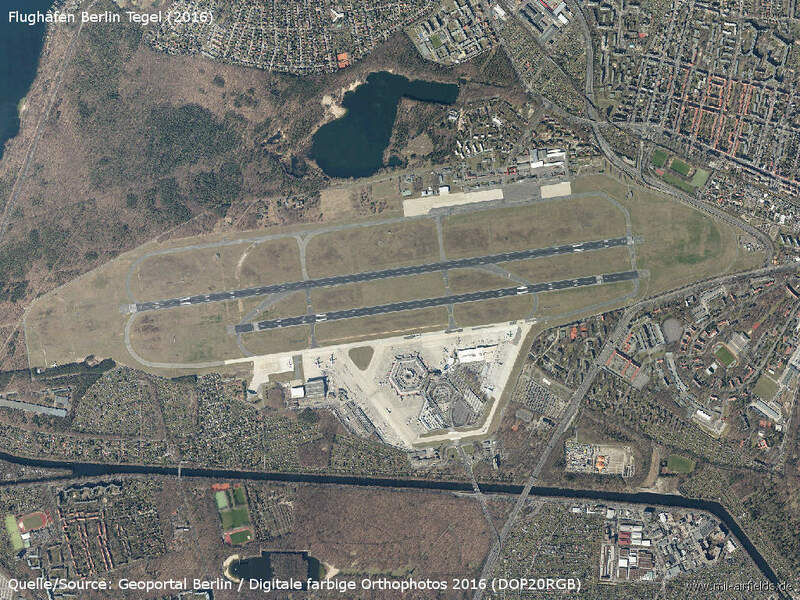 Tegel is scheduled to be closed with the commissioning of the new airport BER. 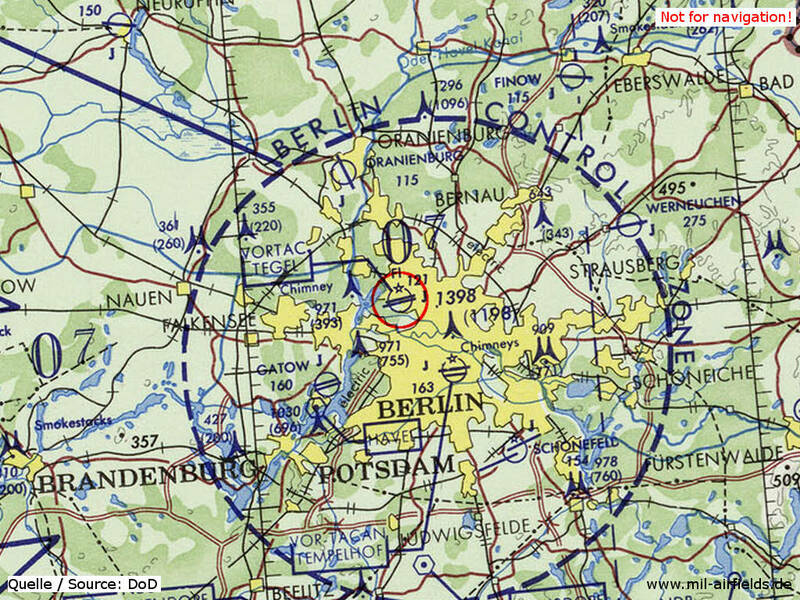 The newly built Tegel airfield on a US Air Force map from January 1949 - Various sources indicate that the airfield was opened with a runway of 2428 m in length. 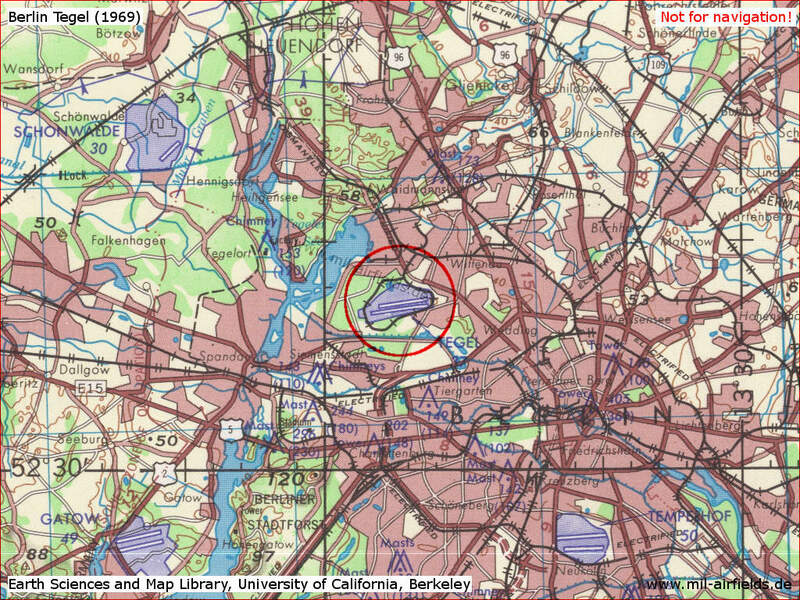 However, on the map it is only 1676 m (5500 ft). 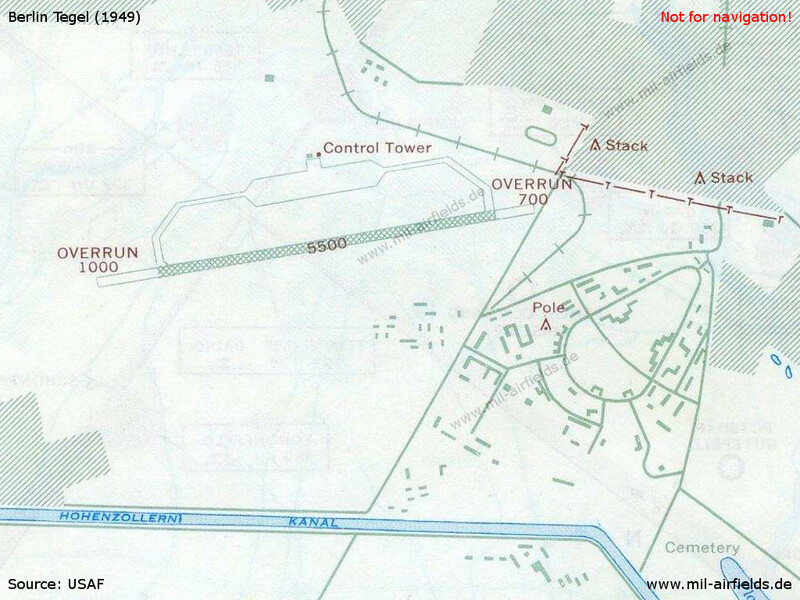 Even with the overruns, the length is only 2194 m (7200 ft). The surface is a symbolized as Pierced Steel Planking (PSP). In the meantime, the field has two runways. 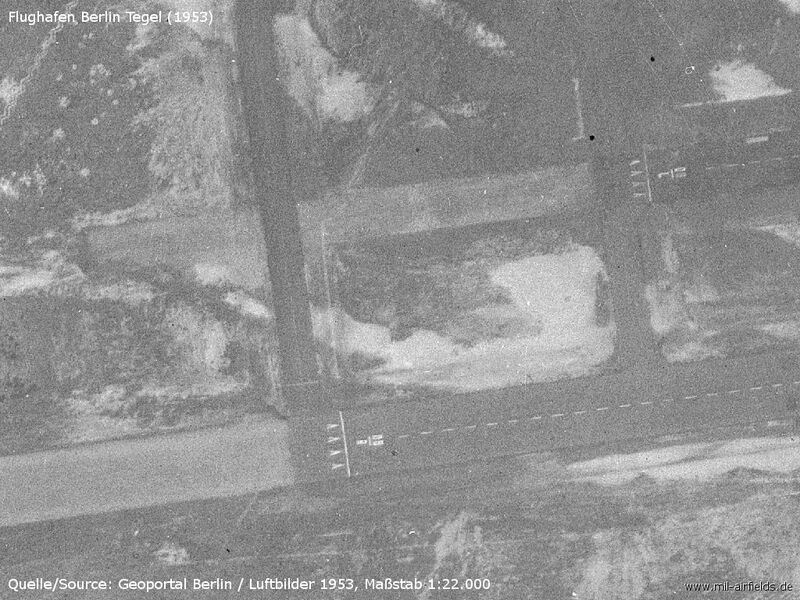 Two Luftwaffe F-84F Thunderstreaks of Fighter-Bomber Wing 32 (JaboG 32) get lost and land in Tegel. A Pan Am Boeing 727 crashes on the approach to Tegel. The aircraft hits the ground in the Döberitz training area (Soviet occupation zone). 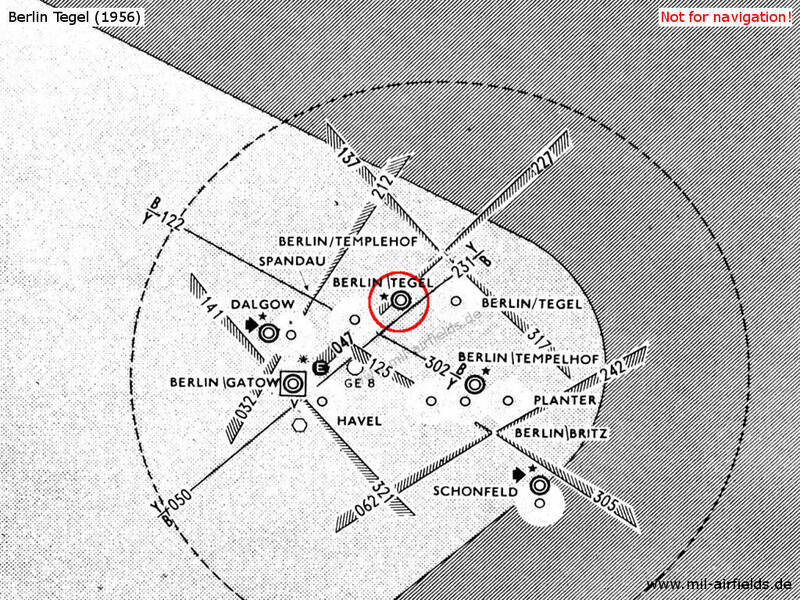 A Soviet pilot accidentally lands with a MiG-21 in Tegel, but can immediately depart again. 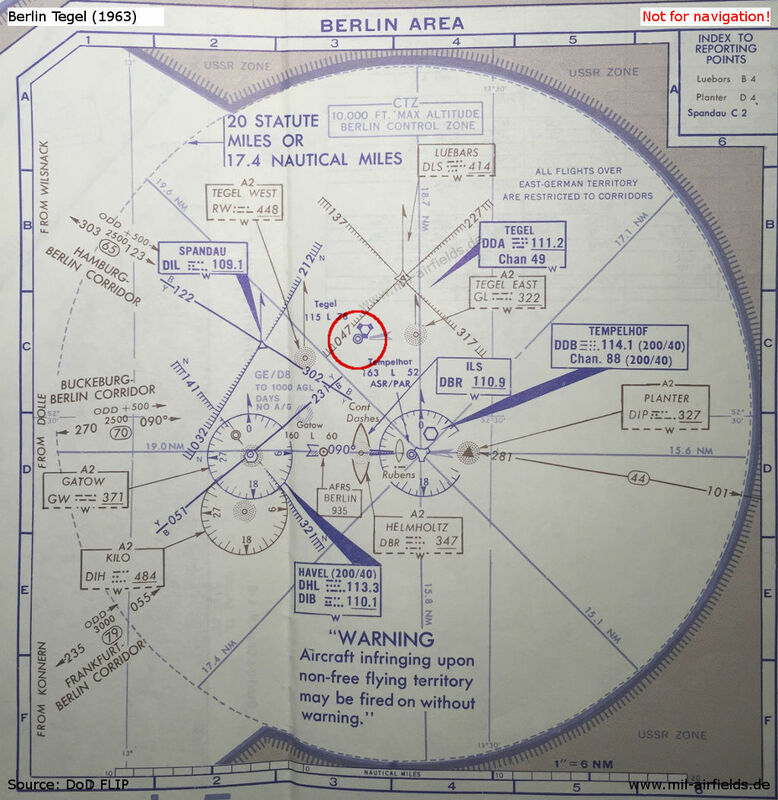 Sources on the Internet suggest that the cause is to be found in similar frequencies of the radio beacon for Tegel and Cottbus. 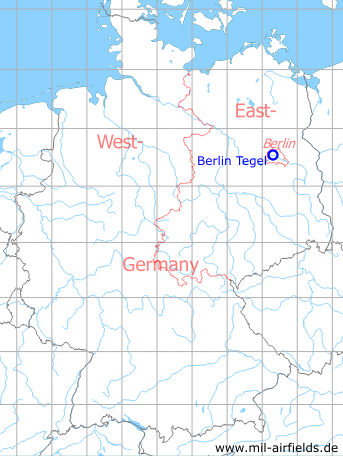 In fact, in the 1960s, the "Tegel East" beacon, with the ident GL, worked on 322 kHz (see map above, later 321.5 and 321.0 kHz), while the Cottbus radio beacon, with the ident MR worked on nearby 321 kHz, at least in the 1970s. 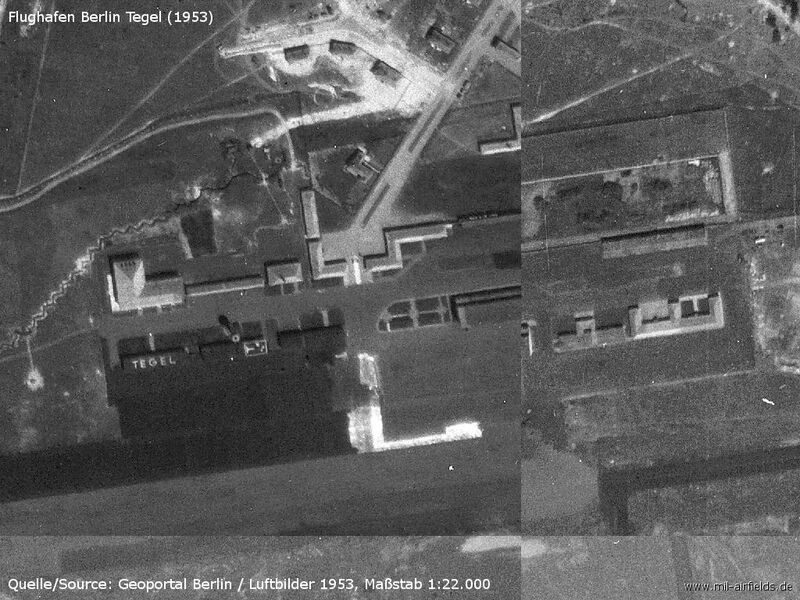 In addition, both airfields have a similar landing direction. 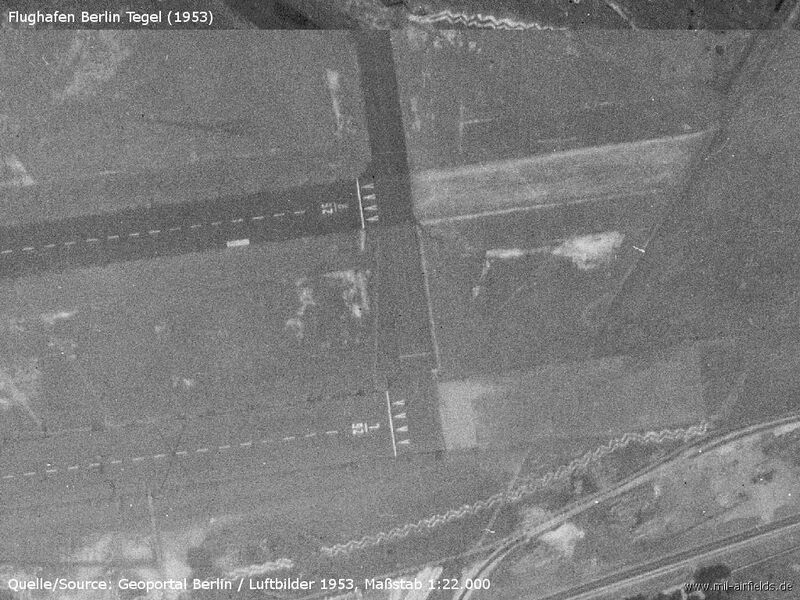 NDB Tegel East: 321.5 "GL"
http://www.16va.be/vols_mmfl_part1_eng2.html - "The 'Air Recce' of the FMLM"
http://www.16va.be/jamming_foxbat_eng2.html - "Jamming the Foxbat" Anecdote from the French SIGINT site at Tegel.